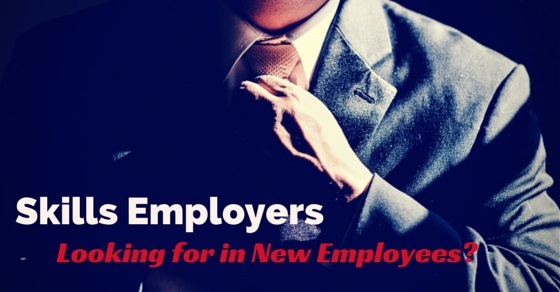 What Skills are Employers looking for in New Employees? As an active job seeker are you aware that for any advertised job openings today, there are around 118 people who apply for the position. Out of the 118, only 20% of the applicants get called for the interview. Most companies use talent management software which rejects the resumes, even before the hiring manager has a look at their CV. Thus competition is very stiff and you have to prepare like a warrior if you want to get your dream job. One of the most common question that job applicants ask themselves over and over again, is what good job skills or work skills employers look for when they hire a new employee. The answer could be tricky and difficult to find. But if you have a little time in hand, you could read the article below and find the answer for yourself in the next few minutes. What Skills Employers Look for When Hiring? The following mentioned are few best personality traits, good employee skills and attributes and important job skills that employer looks for. David Boone, who from his experience as a former President and CEO of Verizon is of the opinion that one of the most essential qualities for a job that a potential employer looks in his new employee, is that of commitment. Here the new employer should be focused and committed to achieve the objectives which the new employer has set for him when he gets recruited for the job. Boone explains that over the years he has tremendous respect for employees who have survived tough and low times and do not cultivate the habit of blaming their colleagues for the problem they face. But the attitude they develop is being committed to their job goals and finding solutions to best combat the problem. Bret Good as senior management personnel at Robert Half International is of the opinion that a good employee should be eager to take the extra mile when his job demands. Bret Good explains that most middle-level managers have a full plate when it comes to their daily job responsibilities. However, if they want to move to the next level, they have to take the initiative to take additional assignments on job. This would, in the long run, help them to develop new good skills to have and also enhance their career. If you do not take extra assignments, you would miss out on opportunities, which you would regret later. In a recent online survey, it has been indicated that 31% of potential employers want their employees to multitask. One of the founders and CEO of Jobdreaming Kevin Watson explains that today, employers do not want their employees to just undertake their regular job responsibilities. In fact job applicants who are eager to learn and also multitask various jobs efficiently, are recruited immediately by potential employers. These are the same people who succeed in their work and there is much demand for them in today’s volatile job market scenario. The MD of Experis Brian Goodman mentions that an employee has to be positive in his attitude and this mandatory skill for work should be present in a new employee. Brian admits that positive people are very contagious and this attitude would make them taste success, no matter whatever the work conditions might be. Since they are contagious, they also create an environment where other people get motivated and give their 150% on job. In the end, the company benefits from the positive work environment in a major way. Dave Gambrill a leadership coach by profession explains that one of the mandatory and important skills and qualities that a new employee should possess is the ability to think with clarity in times of exigencies and take the right decisions for himself and his team. Most leaders in a company do not like managing their employees on a daily basis. But have to undertake this task, as these employees cannot take the right decisions in critical situations. He mentions that he appreciates employees who have the ability to take accurate decisions and offer solutions to the problems they have in hand. Eric Kaplan, CEO of Lexion Capital Management LLC explains that one of the challenges that most entrepreneurs face is the ability to find new employees who have the same passion as themselves. Kaplan explains further by stating that when an employee believes in his company’s goals and objectives, his job no longer remains just an ordinary 9 to 6 job. In fact, he likes his entrepreneur become passionate and work hard to achieve it. The creator of Skilledup.com Nick Gidwani is of the opinion that new employees should add values to their company. The worst thing that they would do is wasting their employer’s time by not being organized in their work. Most employers prefer employees who are very organized and can undertake daily routines like naming files, writing accurate minutes of the meetings and also reminding their superiors of their priority tasks. The quality of being organized at work assures them that will be successful in any project they undertake and this helps to save the company valuable resources. One of the skills employers look for in a new employee is the degree of dependability he offers in his job. Also here he has to do his job consistently in a qualitative manner. The President of Twist Products Wendy Pike considers this quality to be commendable and also explains that this quality would help the employee to grow in the company to a great extent. Most companies have their employees grouped in different departments and these departments have several teams in them. Here it becomes essential that a new employee develops the ability to work in a team and perform well in it. He should also be put forward his ideas during discussions and share various responsibilities of the team with eagerness and agility. A good team member would indicate the fact he could be groomed to be a good manager later on his career. One of the partners of Polachi Access Executive Search, Charley Polachi considers communication skills for jobs in an employee to be very important. Polachi is of the opinion that an employee who enjoys good communication skills needed for a job would effectively impart what his thoughts are with great clarity. Thus there is no chance of error and the project is undertaken successfully without any hassles. An HR magazine in a survey pointed out that nearly 30% of potential employers feel that their candidate is lacking in verbal communication skills you need for a job. A good communicator not only speaks well but also is a good listener and analyses what he listens and then communicates his thought effectively to the other people. Written communication is also important for a new employee. One of the main shortcomings of a CV that a hiring manager would point out is the presence of grammatical errors and spelling mistakes. This is one of the top reasons why CV’s of good professionals get rejected by hiring managers. It is an essential quality which has to be developed by most job aspirants if they want to get their dream job. In the end, it should be maintained that as a job aspirant you have to understand what does your potential employer want from you and do you have the qualities employers look for. The quicker you understand this fact, the more better for you. Remember you are not the only person, who is looking for a job change. In fact, 77% of the current population of America is looking for a change. Competition is stiff and you have to develop your own success strategy using which you can achieve your dream job, by showcasing the best skills for a job that your potential employer is looking for.